Day 1 of the 30 Day Blog Challenge <- click here to find out what I am talking about! 1. A photo of yourself and how your day was. 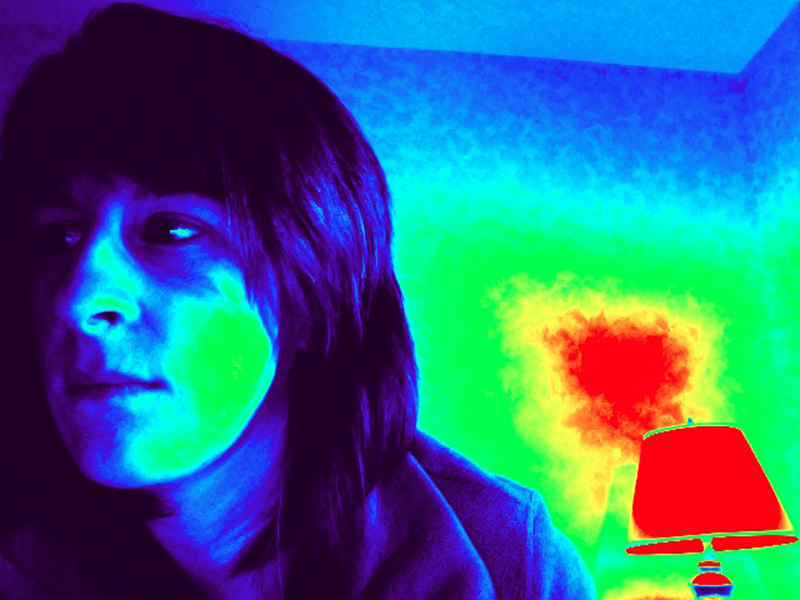 I had fun with the “thermal image” option on my Photo Booth application on my Mac. I think it looks kinda cool. And this is probably how I look while I read stuff online! Today began Week 2 of my PTA school! I did not work today and so I spent most of today preparing for my quiz today and the next 3 days! I slept in and it was delightful. Of course I stayed up late after downloading CandySwipe 2.0 on my Kindle Fire, and then played like an awesome 3 games 5-10 games instead of sleeping. I got up and washed my hair; to make my hair look fairly nice and lay straight, I basically have to do it right away. I can’t really let it air dry without it looking frizzy and with weird flips. In the summer I am lucky that it gets these nice waves when there is high humidity, can’t wait for that again! After this I had my usual breakfast of chocolate milk (yum! ), and a yogurt, today I chose key lime. Then I read my emails while listening to the new Macklemore song, And We Danced, which has an awesome spot with Nordstrom Bridal. Check it out. I studied for a few hours, I think I did nothing for about an hour, then I got ready for class and headed out. I like to get to class early, then I can chat before class or sneak in some more studying before its time to stop. Mondays are Introduction to Physical Therapy from 5pm-7pm which is not the most interesting class. We have a quiz on Wednesday in this class. Medical Terminology starts at 7pm, unless the other class ends early. Today we had our first quiz in Medical Terminology, which is basically just memorizing symbols for chart documenting and abbreviations, and spelling, the whole list is huge. Today we had a spelling test of about 20 words out of like 50+ that we needed to know. Then there was fill in the blank for other medical terms, definitions, and matching. I’m pretty sure I got everything right except for 2 abbreviations that were from other lists, and left behind on the test by my teacher on accident. Week 2 abbreviations and terms will definitely be harder than this last set. And now I am ending today writing this blog, studying Anatomy, and watching Friends! Oh, and eating half a movie-size box of Bottlecaps candy. This entry was posted in 30 Day Blog Challenge and tagged anatomy, blog challege, get to know you, medical terminology, physical therapy, pt, pta, pta school, school on April 9, 2013 by christinapertz1. So, big news everybody!!! I’m so excited to share with everyone that I have been accepted into the Physical Therapist Assistant program at a local school! I cannot wait! Classes start beginning of April and I will be going to school full time for 2 years. I am lucky that I already have a B.A. and have finished my core classes: English, Psychology, and Sociology so I am able to skip those classes (save money) and take classes only 4 days a week. The PTA program is an Associate degree and that’s why I would need the core classes. My schooling will start early April (!!!! ), and I am in the evening classes Monday thru Thursday. Quarters are 12 weeks long with a 1 week break in between quarters. I will continue to work at JoAnns while in school, but probably knock it down to just a few days a week, I hear PTA school is just like having a job. This will be much more intensive than my yearlong Massage Therapy program. I just wanted to share the news with everyone and let you know I will continue to blog, though I may have to learn to plan better. I will also continue my jewelry making as well as my Year of Something New. Speaking of, this month of February was supposed to be my month to read books. As it turns out, I couldn’t get excited about that. So instead I started reading one book, The Walking Dead Compendium 1, which has no page numbers but is most definitely about 1000 pages! My boyfriend bought this for me for Christmas this year, it is a graphic novel/comic and the show is based off this book. Honestly, I have to say I am seeing very little resemblance between the 2! For that reason I am reading it slower than usual. And I find I am not crazily drawn to it like most novels I read, so I can easily read it slowly and think about it and compare it to the show. I can see how they couldn’t follow it exactly because there just wouldn’t be enough drama to hold interest for a TV show. I’m also spending this month working on baby projects, so when that month comes, I think it is March, I’ll still be doing baby stuff, but maybe I will be finding stuff from my other months to try too. Turns out I can’t wait that long to get started on these projects, I have already done so much but I keep finding more stuff I want to make for the babies. Luckily I like to stay busy! This entry was posted in PTA, Uncategorized, Year of Something New and tagged back to school, college, diy projects, february, physical therapist assitant, physical therapy, pta, school, walking dead, year of something new on February 20, 2013 by christinapertz1. Daily Prompt: Go back in time to an event you think could have played out differently for you. Let alternate history have its moment: tell us what could, would or should have happened? This is kind of easy. It would go all the way back to grade school- that is, if I would listen to adults or myself at that age. I would have studied the sciences and math harder and tried to better understand it. Naturally going back that far I probably wouldn’t have done any of those things. So instead, let’s go back to that last year of high school when I was applying for schools. First I might have actually tried to figure out where my talents were, and what I could do with those. Or maybe I would have continued and headed to UT for school, which I did, but instead I actually would have passed more classes and studied harder and taken the time to figure out the purpose of that stupid class that was supposed to help you pick out a major. It didn’t help, I just chose the first thing I found interesting just so I could not take it again. And then maybe after that year was a total fail, because let’s face it, it was; instead of heading out of UT and down to UD, I actually would have stopped to think about what I wanted to do. Maybe it would have been helpful to spend that summer or fall before switching schools learning new things, shadowing/observing different professions, or traveling and working at various places to see what I liked. But no, I shipped on down to UD, where I had some amazing 4 years and certainly don’t regret that, but I wasn’t focused. I started in journalism because I enjoyed writing and editing. I did that for a year, and then one day my friend told me how her roommate was studying for graphic design, and how she thought I would be great at that. I was, I loved it. But it hasn’t gotten me too far. (Or maybe someone could have just said, FYI get an internship!) I’ve had 2 jobs that related to that, and one I left for the other, the other I was laid off…hellooooo recession! Haven’t been paid full time for it since! This entry was posted in Inspirations, Post A Day 2012 and tagged career, history, life, pad, post a day, postaday, revision, school on November 14, 2012 by christinapertz1.